Limpe Fuchs is an improvisor/ composer of acoustic and visual happenings. Born in 1941, studying piano and violin in the early sixties. Started “Anima Sound”, a collective name for twenty years of ‘sound research’ with her partner, sculptor Paul Fuchs. Also known as ‘Anima Musica’, they epitomized the ingenious marginal freak scene of the sixties and seventies and are often cited as a major influence on Krautrock. Anima’s anarchic recordings were radical, atonal improvisations with unconventional instruments, unrestrained creativity, and utterly unstructured performances – primal, experimental free-jazz with a touch of prog-rock. In an unlikely array, instruments like drums, bass and cornet were combined with Paul Fuchs’ own homemade inventions: the Fuchshorn, Fuchszither, and Fuchsbass; Limpe Fuchs’ wordless vocal yelps and screams; and audio-visual machines: light-ray oscillographs and movement holograms. Fringe community outsiders, the Fuchs took freak-out avant-garde to a new level. Christoph Heemann was a founding member of the anarchic noise-collage project Hirsche Nicht Aufs Sofa (HNAS), that released a string of bizarre, dada-inspired records during the mid 1980s on their own imprint DOM records. Although Heemann is now dismissive of much of the output of his first group, he regards their 1987 release “Im Schatten Der Möhre” as the pinnacle of their recorded career. The early 90’s saw Heemann’s first solo releases, arranging a subtle sound space of psychedelic concrete minimalism. Within a decade he had built up a fantastic catalogue of records on labels such as Extreme (“Invisible Barrier” CD), Robot Records (“Magnetic Tape Splicing” 12″) and Barooni (“Aftersolstice” CD). At the same time Heemann also founded the Streamline label which has been busy releasing a diverse catalogue of records from artists such as Intersystems, Nurse With Wound, Ora, Ragnar Grippe. Heemann has also been active in a number of diverse projects during the last 15 years, such as the group Mimir (with Edward Ka-Spel and Silverman, Andreas Martin, Jim O’ Rourke), and most notably, Mirror (with Andrew Chalk). Currently he also shares the duo-project In Camera with Timo van Luijk. Throughout the years Heemann also provided numerous musical and graphical contributions on records by Current 93, Organum, Tony Conrad, Merzbow, Limpe Fuchs…. Steve Stapleton wrote history since the first Nurse With Wound album from 1979. He’s often considered as one of the pioneers of the British industrial music scene but has in fact explored a much wider range of styles, including free-form improvisation, psychedelic underground, collage and minimal music. An important constant in Stapleton’s work is surrealism, deeply present in most of his output radiating an uncompromised focus for creative contrast and excentric subtlty. This aesthetic also manifests itself in his work as a graphic artist and painter. Under the name ‘Babs Santini’ he created the artwork for most of the Nurse With Wound albums, as well as for other artists, such as Current 93, Asmus Tietchens, Coil… Quite a few of these titles got released on his acknowledged ‘United Dairies’ label (also formed in 1979) along with other albums by HNAS, Guru Guru, Nihilist Spasm Band, Volcano the Bear. Throughout the years Stapleton did collaborations with groups as Whitehouse, Organum, Stereolab but mostly with David Tibet/Current 93 and Colin Potter with whom he forms the core of Nurse With Wound. Since last few years Stapleton does live appearences again with Nurse with Wound and recently he collaborated on an album with Faust. 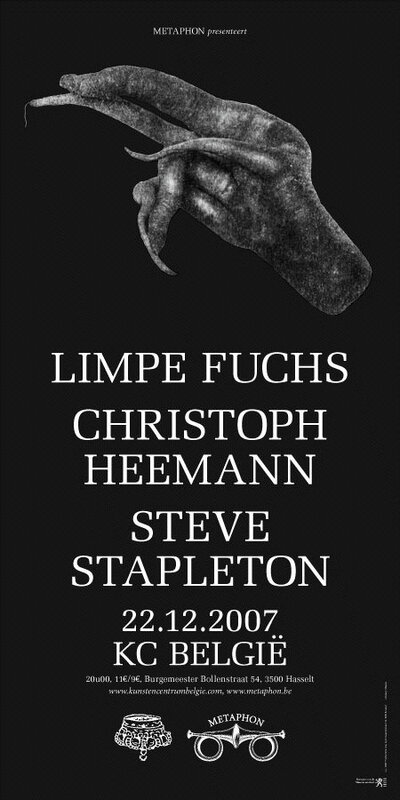 Christoph Heemann and Limpe Fuchs will be performing a solo set with consequently a unique trio performance with Steve Stapleton as special guest.